This article was published on 01/08/2014. Now that 2013 is over, I feel like doing a top five list of something. The following is a list of my top five Nintendo games of 2013. I know it's a bit late for this, but late is better than never. You might be wondering why this isn't a top ten. That's because I didn't play very many new games in 2013, and that list gets even shorter when you restrict it to just Nintendo games. Because this list only includes games I've played, don't freak out if there are a few games missing that you feel deserve the recognition. With all of that out of the way, I think it's time I begin. #5) Luigi's Mansion: Dark Moon for the Nintendo 3DS is my number five. This was an unexpected one for me. The original Luigi's Mansion came out over a decade ago as a GameCube launch title, and it was poorly received by critics. I liked it, myself, but I realized that it didn't compete with the likes of Super Mario 64. So it was a total surprise to me when I heard the announcement for a Luigi's Mansion sequel. I was also surprised to hear how well received the sequel was, once it came out. I admit I wasn't particularly looking forward to Dark Moon, because despite liking the first Luigi's Mansion, I wasn't clamoring for a sequel. I'm glad I played it, though, because this game is good. It's more or less the same as the first game, with Luigi going Ghost Busters and vacuuming up a bunch of ghosts inside of an old mansion. 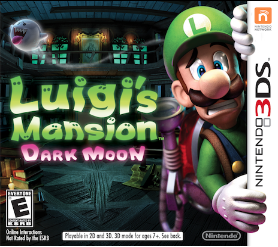 Dark Moon ups the ante by allowing Luigi to explore multiple mansions instead of being restricted to a single one. As a result of that, Dark Moon is longer and has more variety than the original, which satiated critics everywhere. The one thing I didn't like about Dark Moon was the mission based structure they added to it; the original Luigi's Mansion had a slight Metroid vibe to it with the exploration, but Dark Moon takes that and makes missions out of it. While I still prefer the original, Luigi's Mansion: Dark Moon is a solid game. 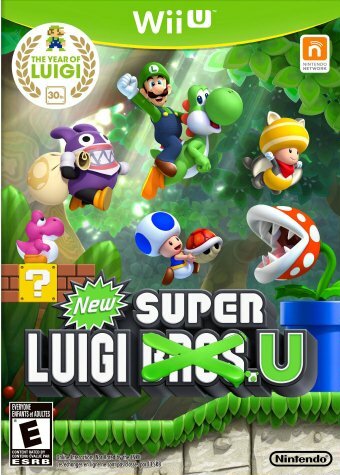 #4) New Super Luigi U is number four on my list. This game is DLC for New Super Mario Bros. U on the Wii U, so it's not really a full game. I was totally unenthused for this one, because it looked like a cheap ROM hack of the original game. In some ways, that's exactly what it is. New Super Luigi U uses the same exact world map as New Super Mario Bros. U, but it redesigns all of the levels. Even a lot of the tiny cut scenes have little to no modifications. Despite all that, though, I thoroughly enjoyed this one. Maybe it's a guilty pleasure, but I had an absolute blast playing New Super Luigi U, and I couldn't figure out why. In fact, I think I enjoyed this game more than the original. It's obviously inspired by The Lost Levels, in that it's meant to be much more difficult than the original, and you can play as Luigi. Luigi retains his attributes from The Lost Levels, meaning he jumps slightly higher than Mario, but also slides on the ground more whenever he stops. There was no reason for me to enjoy this game as much as I did. I can't quite put my finger on it, but I think it's the level design. The levels are all designed very well. You get only 100 seconds to beat each level, so the levels are much shorter than in the original game, but that somehow only adds to the appeal. Don't underestimate New Super Luigi U like I did, because it's super fun. 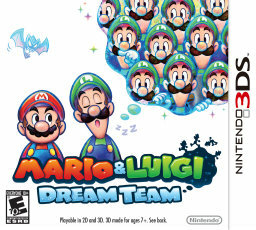 #3) Mario and Luigi: Dream Team is the third game I'd like to talk about. Pretty much every single Mario and Luigi game is gold, so I was expecting this game to be good. I wasn't disappointed. It has a few problems here and there, but Dream Team perfectly encapsulates what makes the Mario and Luigi series so great. It's a fantastic RPG with incredibly fun battles, a great art style, fantastic music, and is just plain fun. Despite being turn-based, the battles are very action packed, testing your reflexes, timing, and memorization. Outside of the battles, there are plenty of fun Zelda-like puzzles to solve, and you progressively acquire new abilities that enable you to solve new puzzles. The Mario and Luigi series is a near perfect formula, but when it comes right down to it, their high quality comes down to the impeccable execution. That execution is still here in full force within Dream Team. This game is like a dream. #2) The Legend of Zelda: A Link Between Worlds is one of the best games on the 3DS, and so, it makes number two on my list. It's a love letter to all those who love A Link to the Past dearly. A Link Between Worlds uses the same over world as A Link to the Past, but is an entirely new game. Even though it's a direct sequel to A Link to the Past, it still features a different Link and takes place like a century later. The main selling point to this game, besides the fact that it's a freaking sequel to A Link to the Past, is its nonlinear nature. You can explore the dungeons in almost any order you please, due to an item rental system pioneered in this game. I've been saying for years that Nintendo should make a totally nonlinear Zelda game, and it looks like they read my mind, because this is it. I've wanted to play a Zelda game like this for years. Really, what can I say about this game that hasn't already been said? It was one of my most anticipated games of 2013, and for good reason. A Link to the Past is one of my favorite games of all time, so this game was quite a big deal for me. On top of the insurmountable nostalgia it provides, this game delivers non-stop awesome, from the beginning to the end. #1) Super Mario 3D World is just what the Wii U needed, and it's my top Nintendo game for 2013. I'd even go as far as to say that it's my game of the year for 2013. This game has amazing graphics, top notch level design, an outstanding orchestral soundtrack, and is polished to gleam like a diamond. On top of all that, it even does four player cooperative multiplayer. Super Mario 3D World is up there with greats like Super Mario Galaxy 1 and 2. It shouldn't come as a surprise, because it's made by the same development team. At first glance, 3D World doesn't look that different from its inspiration on the 3DS, Super Mario 3D Land. Upon closer inspection, however, you'll discover that 3D World is its own special animal. 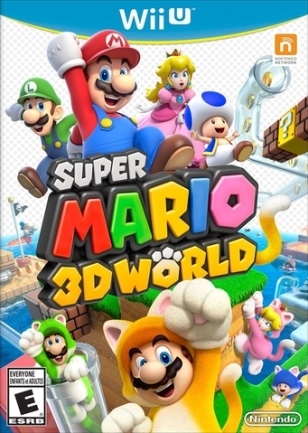 3D World is a perfect harmony of 2D and 3D Mario, bringing the best of both worlds into a single game. It makes the impossible possible. In addition, the game is quite long and challenging, sporting a ton of levels. There are almost no flaws here. If you were ever on the fence about the game, don't be. Get this game immediately. 2013 was a good year for Nintendo games. Any year that sees a game as good as Super Mario 3D World and the sequel to A Link to the Past is a good year, I would say. It's true that the Wii U has been sparse with game releases lately, but Super Mario 3D World makes up for that, I feel. And yes, I know that I'm missing some other potentially good Nintendo games on this list, like Pikmin 3 and Fire Emblem: Awakening. Like I said, I can only put the games I've played on this list, and I haven't played either of those. 2014 might see the release of the next Super Smash Bros. game, so we have a lot to look forward to. Nintendo has its ups and downs, but it's good to know that they're still putting out quality titles. 1,388,115 people love this site.